The Oklahoma Hall of Fame is a nonprofit organization that preserves Oklahoma’s history and promotes pride in our great state. Through the organization’s various educational programs, events, publishing activities, and at the interactive Oklahoma Hall of Fame and Gaylord-Pickens Museum, the organization tells Oklahoma’s story through its people. The Teen Board offers students the opportunity to learn more about Oklahomans who have changed the world, while at the same time learn valuable real-world skills that help them develop connections to their communities. Now in its 13th year, the Oklahoma Hall of Fame Teen Board continues its statewide impact. Students will meet and interact with peers from across Oklahoma, have the opportunity to meet notable Oklahomans, and participate in organization and Museum programming, including the 92nd Oklahoma Hall of Fame Banquet & Induction Ceremony. The Teen Board is responsible for planning and implementing an annual fundraiser to benefit the education programs of the Oklahoma Hall of Fame and Gaylord-Pickens Museum's Free Field Trip Program. Each member of the Teen Board will be responsible for attending all meetings, serving on a committee, and participating in fundraising. Applicants should be Oklahoma students in 9th through 12th grade for the 2019-2020 school year. Teen Board Members are selected after completing an application and interview process. Each application must be accompanied by a letter of recommendation from an adult (other than a parent or relative) who knows the applicant well. Applicants will learn whether they have received an interview by the week of May 27th. Interviews will be held on the phone and at the Museum June 3-14. Teen Board members will be selected and contacted by Friday, June 28th. Applicants will be contacted via phone and/or e-mail. Teen Board members will serve a five-month term, beginning in August and ending in December. Those selected for the Teen Board must attend an orientation meeting in August and commit to a monthly meeting held on the second Monday of each month: September 9, October 14, November 11, and finish the year with a special holiday community event on Saturday. December 14. Please evaluate these dates prior to applying for this commitment. Teen Board Members will have an opportunity to participate in an incentive program to serve as escorts for the Class of 2019 and other dignitaries at the 92nd Oklahoma Hall of Fame Banquet & Induction Ceremony held in Oklahoma City on November 21. Verification of volunteer hours will be provided and, if requested, letters of recommendation to colleges or potential employers will also be available. Contact Jeff Jacobsen, director of marketing and communications at 405.523.3208 or jpj@oklahomahof.com. 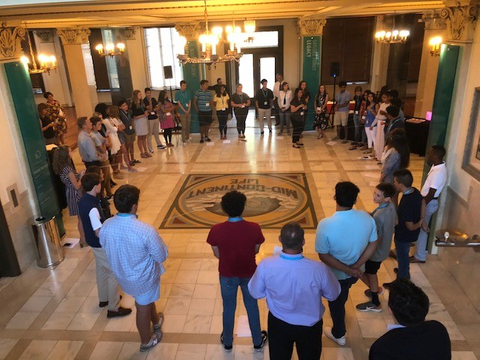 In 2018 Oklahoma Hall of Fame Teen Board welcomed 42 students from 22 high schools across the state to help support the mission of the Oklahoma Hall of Fame, to tell Oklahoma's story through its people. TO APPLY, PLEASE CLICK THE APPROPRIATE BUTTON BELOW AND FILL OUT YOUR SECURE APPLICATION. YOU WILL RECEIVE A CONFIRMATION EMAIL UPON SUBMISSION. The Oklahoma Hall of Fame is proud to offer students for all 77 counties across the state the opportunity to visit the Gaylord-Pickens Museum in Oklahoma City for FREE as part of the Free Field Trip program, powered by the Oklahoma Hall of Fame Teen Board. Through the annual Teen Board fundraiser we can reach over 5,000 students throughout the state. Student groups from 5 to 150 can receive free admission to explore the museum, take a guided tour, and also receive a $4.00 per student fuel stipend, or Chick-fil-A sack lunch. This important hands-on opportunity is critical in today's challenging educational environment.